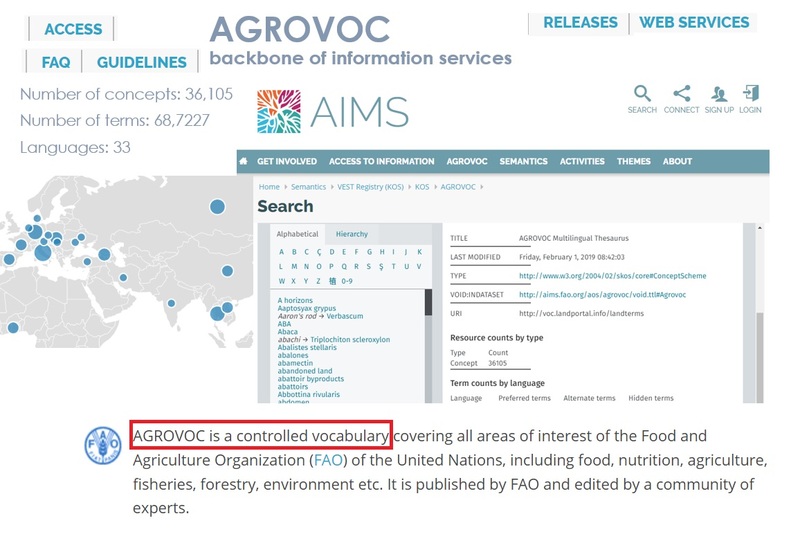 Dear AGROVOC Friends, did you know that starting April 2017, the FAO AGROVOC multilingual thesaurus - available for re-use as a Linked Open Data under the international CC-BY IGO 3.0. license - has been updated on a monthly basis? You are invited to contribute to expansion of the AGROVOC knowledge base (concepts/terms and relations); please, see details below. Browse AGROVOC with SKOSMOS and check which AGROVOC terms/concepts could already be useful and relevant to Your work! If you ever need to suggest a new concept and are not an AGROVOC Editor, please remember that you can also do it by email to agrovoc@fao.org. Please send the suggested new concept in English, with any translations available,suggested broader term if possible, and the definition with source (the more information, the better!). It will then be reviewed. The INRA (French National Institute for Agricultural Research) Department of Scientific Information (DIST) maintains the institutional reference vocabulary VocINRA (with 93,000 terms and synonyms) that is used internally by STI professionals and researchers to index scientific textual content in the institutional archive ProdINRA and describe the activities of labs and people in the institutional directory. To improve the quality of VocINRA (that has expanded in up to 8 thematic entries and approx. 10,000 hierarchical relationships) and to conform it to the open science principles adopted by INRA, namely make it FAIR, and linked to external open semantic resources, VocINRA is going to be interlinked with the Global Agricultural Concept Scheme (GACS). GACS includes in its pool of interoperable terms and concepts from AGROVOC multilingual agricultural thesaurus, the CAB Thesaurus and the NAL Thesaurus. The research from the DELICIOUS project described in this use case aims at producing well-balanced products, here dairy gels, in terms of nutritional requirements (e.g. less fat, salt, and sugar) while using eco-friendly transformation processes. This requires an advanced analysis of the production process according different criteria, and relies on the combination of heterogeneous data and knowledge (on food composition digestion, digestion, sensorial perception, food processing, etc). The integration of the data with a great variety in types, vocabularies, and formalisms, is realized with the help of an ontology: PO2 (Process and Observation Ontology) that has 90 classes and 122 properties. Alignments with the already mentioned AGROVOC, NALT, and GACS are computed using an in-house tool, PO2VocabManager developed in Java. EMBRAPA has an extensive knowledge base of publications and data used internally (researches, technicians, librarians and managers) and also externally by users and customers, though services and technologies, as well as the academic and scientific community. For its internal use, EMBRAPA developed a controlled vocabulary, AgroTermos.This vocabulary needs to be consolidated in its terminological component (Brasilian, Portuguese), and corporate and operational processes supported by the conceptual model of agricultural knowledge representation. AgroTermos was initially constructed starting from the commonalities of the Portuguese terminologies already existing in the agricultural thesauri AGROVOC, CAB and Thesagro. One of the expected impacts of AgroTermons is to achieve better mapping, organization, recombination and dissemination of Brazilian agricultural data and information based on better interoperability between internal and external information systems. For this purpose, it is intended to reuse the methodologies, ICT and good practices used for the construction of the GACS (linked to the AGROVOC thesaurus) with which AgroTermos should interoperate via webservices. The Solidaridad Network develops sustainability intervention projects with farmers around the world, in partnership with supply chain players in over 10 different commodities. Gathering and analysing data is fundamental for developing the content and scope of different interventions, as well as assessing their efficacy and efficiency. To support these interventions, besides the AGROVOC Thesaurus (used to index digital library of support material on sustainable farming), two local taxonomies have been developed. The first is a taxonomy that classifies farming practices considered relevant for sustainability assessments. The second taxonomy structures the farmers, farms and farming systems’ profile characteristics and hard data collected, as well data format requirements. To develop and maintain these taxonomies, VocBench3 with GraphDB have been used, while a CMS is being developed to consume these data for indexing. The Poznan Supercomputing and Networking Center (PSNC) is one of the partners contributing to the FOODIE project. In the frame of this project, the PSNC plans to publish farm-oriented data available as Linked Data, in compliance with the Linked Data - INSPIRE specifications. This also includes the discovery of links with relevant datasets in the Linked Open Data (LOD) cloud [you can browse for LOD vocabularies, AGROVOC comprised, following this link]. The beneficiaries of this work would be farmers, farm associations, and the public authorities. To date, the FOODIE project uses FOODIE ontology. This latter enables the representation of data compliant with the agriculture FOODIE data model in semantic format and their interlinking with established ontologies and controlled vocabularies (e.g., AGROVOC thesaurus). The FOODIE ontology (available also on GitHub) data model is structured to support different agricultural-related concepts including agricultural facilities, crop and soil data, treatments, interventions, agriculture machinery, etc. The FOODIE ontology can be used for different semantic tasks, such as semantic data integration, data semantization (transformation of (semi-)structured data to semantic format); ontology-based data access (e.g., accessing relational databases as virtual, read-only RDF graphs). Food security requires to select better adapted plant species and varieties to global changes. A way to do that is to use high-throughput phenotyping. There are 3 types of high-throughput phenotyping platforms: (1) field, (2) green house or (3) omics platforms. Since these platforms work with different species and protocols, and there is a need to compare data (especially between field and green house) populating these platforms, semantic interoperability among these latter should be established. As the basis for its establishment, AGROVOC thesaurus, GACS, Plant Ontology, Crop Ontology, Unit Ontology, PATO, Trait Ontology, Phenome Ontology (all accessible on AGROPORTAL) have been used to link different semantic concepts. To organize and reason on aligned data, both hierarchical (present in the aforementioned ontologies) and horizontal links are useful. Consequently, there is also a need for application ontologies, in their turn, to be mapped to references ontologies to be understood by other people.